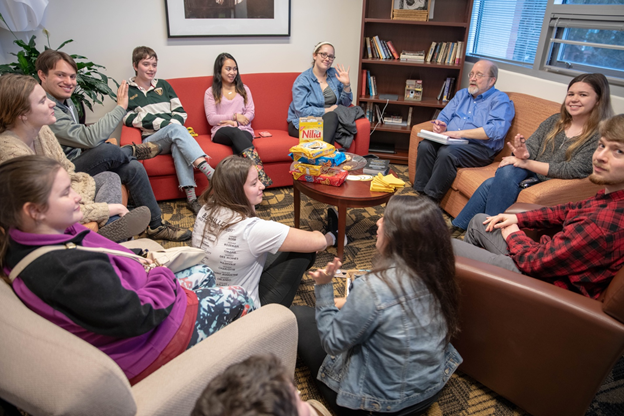 Students, faculty, and staff in the Honors College—and in departmental and college Honors programs across the university—need more opportunities to meet, talk, plan, collaborate, celebrate, serve, and learn, together. Cookies with Jeff this past Friday? A case in point. I emerged from two great hours of non-stop conversation with a deeper understanding of 15 Honors College students, and ideas and suggestions to improve the university and the Honors College. Highlights to work on: (1) The scarcity of study spaces across campus, especially during finals week. Student suggestion: could students be granted 24-hour access to academic buildings during that time? (2) The need for evening quiet hours in Appalachian Hall, at least at semester’s end. And (3): can we create better ways for entering Honors College students to find Honors roommates? I also nibbled on too many superb gingersnaps. Maybe offer Celery with Jeff in the near future? Please watch for other new opportunities, seek conversations, and keep your suggestions coming! The photo above shows students at the semester’s first Cookies with Jeff. Photo by Garrett McDowell. If you are interested in applying to become an Appalachian Ambassador, there is still time! The first mandatory meeting is today from 6 to 7:45 pm in the Parkway Ballroom of the Student Union. Applications are open until January 25 at 5 pm on AppSync. For more information, please click here. The Z. Smith Reynolds Foundation (ZSR) is seeking to invest directly in young innovators, change makers, visionaries, entrepreneurs and risk takers with bold ideas for how to make a difference in North Carolina and its communities. The newly established All For NC Fellowship is a 12-month program designed to provide funding, coaching and mentoring to young people who have a vision and plan that could contribute to a better life for North Carolina’s people and communities. The application deadline is January 25 at noon. To learn more and how to apply, please visit our website. Study abroad this summer studying Cuba through dance and food! The travel dates for “Ritmo y Arroz: Cuba” are June 8 through June 22. This is a great opportunity to fulfill your study abroad desires for a very decent price! Please visit our website to learn more! UReCA: the NCHC Journal of Undergraduate Research and Creative Activity is looking for undergraduate students to serve as editors of the journal. The deadline to apply for an editorial position is January 31. Please click here to learn more. The Tech4Teach Fair is preparing for another event on March 20. If you have an idea regarding teaching and learning through technology that you would like to present, you can apply by the early bird deadline on January 31. If you submit by the early bird deadline you are given first choice on time slots. For more information and how to submit your proposal, please click here. On Tuesday, January 29th at 7:00 p.m. Benjamin Jealous Appalachian’s Dr. Martin Luther King Jr. Commemoration speaker will be in the Schaefer Center. His topic is, “The Forgotten Origins and Consequences of Race in America.” For more information on this event, please visit our website. The films, "Saving Snow" and "32 Degrees", focus on the threat of climate change to the ski industry in the southern US. Following the screening, there will be a discussion panel of experts from the recreation and the ski industries. The screening will be on January 29 at 7 pm in I. G. Greer Hall. For more information, please click here. This spring, the career center is holding serval events that students should take advantage now. Beginning on January 24 and ending on January 29 from 11 am to 1 pm there will be resume clinics held in the Student Union. On January 30, there will be an internship expo from 11 am to 2 pm also in the Student Union. For more information and a complete list of upcoming events, please visit our website. The next online workshop for the Spring semester will be held on February 20 and will discuss “Evaluating Online Sources.” You can register online today by visiting our website and following the instructions. On January 24 from 3 to 4 pm, there will be an online workshop teaching you how to use two new, free, non-google tools for searching scientific and scholarly literature. For more information and how to register for this workshop, please click here. Photo above features the Appalachian team receiving the Expedition of the Year award in Atlanta on December 1, 2018. 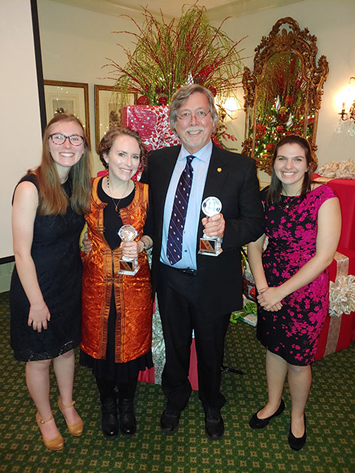 Featured (left to right): Honors Alumna Olivia Paschall, Dr. Sarah Carmichael, Dr. Johnny Waters, and Allison Dombrowski. Honors Alumna Olivia Paschall had a remarkable and noteworthy final month leading up to her December 2018 graduation. In Honors at Appalachian, Paschall was a geology major mentored by Dr. Sarah Carmichael, associate professor of geology, and Dr. Johnny Waters, emeritus professor of geology and Honors faculty. On December 1, 2018, Paschall was recognized as part of the Explorers Club/National Geographic expedition to Mongolia, which won the Expedition of the Year award from the Atlanta Chapter of the Explorers Club. The following week, Paschall defended her Honors thesis, Exploring Late Devonian Mass Extinctions and Ocean Anoxia Events in Understudied Paleoenvironments of Asia, which she completed under the mentorship of Dr. Carmichael and second readership of Dr. Bob Swarthout, assistant professor of chemistry. The week after that, Paschall headed off to the American Geophysical Union annual meeting in Washington, D.C., where she presented the results of her research in Vietnam, one part of her thesis. She is the first author on a manuscript resulting from that research that has been accepted pending revision for publication in an international peer-reviewed scientific journal. For the complete story by Garrett McDowell, click here. 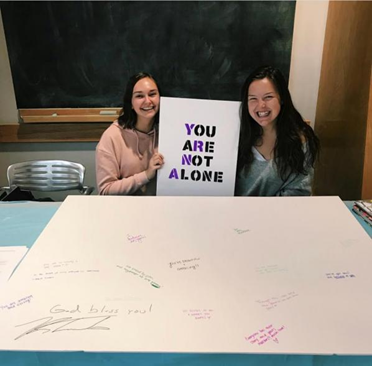 Photo above features Bailey Sparks (left) and Grayson Rice (right) at the #YouAreNotAlone Campaign information table for students to learn more about sexual assault on college campuses. The table was held on Monday, November 26, at the Plemmons Student Union. Photo submitted. Honors sophomores Grayson Rice and Bailey Sparks have co-founded the #YouAreNotAlone Campaign at Appalachian State University. The goal of the campaign is to spread awareness, build community, and support survivors of sexual assault. They created a website with information about sexual assault on college campuses, local resources to help survivors, and their event schedule. Rice is a communication, journalism and public relations, major, and Sparks is majoring in elementary education. Their idea for the campaign was spurred by a praxis project in their interdisciplinary Honors seminar HON 2515: Education and the Practice of Freedom taught this Fall 2018 semester by Dr. Greg McClure, associate professor of elementary education in Appalachian’s Department of Curriculum and Instruction. For the full story by Garrett McDowell, please click here.